Well, technically May is preservation month here in the states, but I am making a declaration of my own for May of 2018, because I have some very exciting news! I am officially declaring May to be Old Windows Month! I have been long toiling over a follow up book to my bestselling books Living in the Past (2014) and Old Windows Made Easy (2015) and if you follow me on Instagram, you may have seen some sneak previews of what I have up my sleeve. 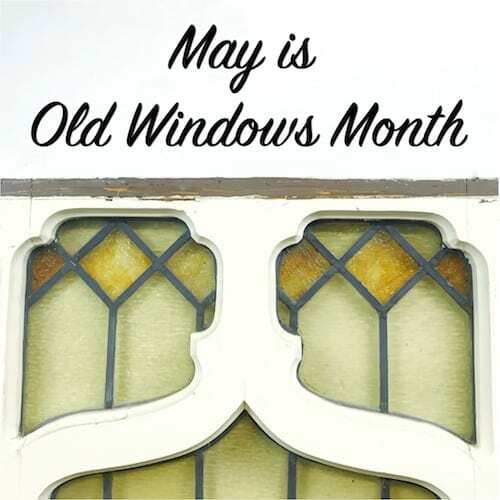 So, why is May Old Windows Month here at The Craftsman Blog? Because on May 23rd, 2018, I’ll be releasing my new book Old Windows In-Depth! It’s available for pre-order now and will begin shipping on the release day. So, grab your copy today! Yes, I’ve already written a book about how to restore old windows, so why do you need another? 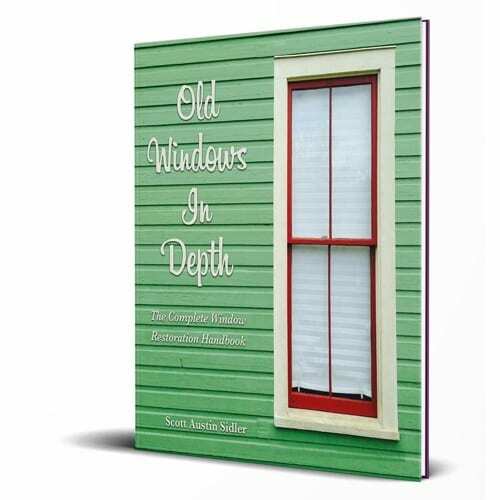 Well, Old Window Made Easy was never intended to be a comprehensive book about old windows. It is a 76-page workbook to show you the simplest way to restore a historic double hung window. I left out a lot of the other information intentionally because I didn’t want it to get in the way of the heart of the process. Old Windows In-Depth takes everything included in the first book and fills in the blanks and expands it greatly. In fact, Part 1 of Old Window In-Depth is actually the direct text from Old Windows Made Easy so you can get two books in one! Part 2 goes into a new level of detail on all of the other repairs that you have been asking for as well as adds the full text of Steel Windows Made Easy. So, it’s actually 3 books in 1! I heard all of your comments and questions over these last couple of years about windows and I have compiled them (along with the answers!) into clear and concise tutorials that are easy to follow and execute. Here’s just a small sampling of some of the topics I cover in Part 2. I’ve taken the original 76 page Old Windows Made Easy book and expanded it to over 200 pages of window goodies and knowledge bombs to help you tackle almost any window restoration project. And as always, it is filled with tons of full color pictures! As if launching the ultimate window restoration book wasn’t enough, I’ve still got more surprises for you that you don’t want to miss this month. It is Old Windows Month, right? Check out these other surprises just for my readers! On May 16th, 2018 at 2 PM ET I’ll be joining Indow to lead their Window Hero Webinar where I’ll discuss my new book and show you some of the technics I cover in the book as well as going over spring tune up techniques for your old windows. It’s a 20-30 minute webinar with a live Q&A afterward with me so you can feel free to bring your questions. You don’t want to miss it because I’ll be giving away FREE copies of my new book to 20 randomly selected participants of the webinar! You can sign up for the webinar here. I want to save as many historic windows as possible. After selling tens of thousands of books, I’ve been able to accomplish that, but it’s still not enough! So, to make my mission even easier, I have decided to slash the price on my Old Windows Made Easy book to make sure there is no reason that you can’t restore your old windows. The old price of $34.97 has now been slashed to $19.97! That’s over 40% OFF! And the eBook has been cut from $25 to $17. This is still an extremely valuable book that has thousands of dollars of value tucked inside its pages, so this pricing is a pretty crazy if you ask me, but if it helps save even one more window, then it is worth it to me. Get Old Windows Made Easy here! In case you’re wondering if Old Windows In-Depth is the right book for you, I’m going to be giving away free chapters in the form of weekly blog posts all during the month of May. Each week you’ll find a new chapter posted here on my weekly blog posts. That’s right, I’ll be giving away 3 chapters of my new book for FREE! I’m hoping by the end of the month, you’ll see exactly how valuable this new book is if you are planning to restore your windows and that you’ll grab your copy. Well, are you ready for Old Windows Month here on The Craftsman Blog?! I know I am! Get ready for some serious window restoration content this month. Hello, we live in a house built in 1927. We discovered that our windows have lead paint on the exterior, some on the interior, and three interior doors have lead paint. With a baby and a three year old, I’m freaking out a bit and the lead abatement company wants us to replace everything. How safe is it to restore/ strip these with the concern of releasing the lead into our home in the process? I’m after information on side hung casement windows and top hung fanlights. I have late 1920s Californian bungalow with almost every window lead-lighted. Are these sort of windows in the new section? Is there information about restoring basement Windows? Everyone seems to ignore wooden basement Windows and I’d like to restore mine and install period appropriate storms/screens on mine. I know a lot of information carries over from regular wooden Windows, but I can’t seem to find anything about storms/screens, weatherstripping etc. Any advice? ?